By now, Lance Stephenson's list of egregious acts from Game 5 of the Eastern Conference finals are well-known: He blew air into LeBron James' ear, interrupted a Miami Heat huddle and got caught flopping for the second time. Heat coach Erik Spoelstra almost never holds a practice the day after a road game, especially when the team plane lands around 3:30 a.m. as was the case in the wee hours of Thursday. But Spoelstra deviated from the norm on the day before Game 6 of this East title series, not for any one on-court issue but rather so the two-time defending NBA champions could relieve some frustration.And on Thursday, the Heat tried to get their focus back on themselves. The Heat still lead the series 3-2, and get the chance to close the Pacers out for the third straight year on Friday night. The game is in Miami, where the Heat have won their last 10 playoff contests. Predictably, the talk on the off day wasn't so much about Paul George scoring 37 points to lead his team to a season-saving win, or even how James was held to seven points on a night that he was rendered silent for long stretches because of foul trouble. ''Just playing ball, man, having fun and enjoying the moment,'' Stephenson said.Instead, the buzz was almost entirely about Stephenson, who has simultaneously become a Heat frustration and Internet sensation. Images of his already-infamous ear-blowing stunt were widely distributed on social media moments after it occurred in Game 5, and he didn't back down Thursday when asked about his desire to pester the Heat. Spoelstra didn't react when Stephenson - who said James was showing signs of ''weakness'' earlier in the series - crashed the Heat huddle. Much like his players, Spoelstra didn't bite when asked about the excitable Pacer guard's attempts to throw Miami off its game. Indiana coach Frank Vogel didn't seem to mind the huddle move, though suggested the ear-blowing decision was a bit much. Stephenson and Pacers center Roy Hibbert flew to Miami with slightly lighter wallets; Stephenson was fined $10,000 by the NBA on Thursday for his second flop of the series, Hibbert $5,000 for another flopping violation. It marked the second time in as many games that a Pacer has drawn a fine, with George having gotten dinged for $25,000 after blasting the officiating following Indiana's loss in Game 4. In George's case, the money might have seemed well-spent. Indiana took 22 free throws in Game 5 to Miami's eight, a total that matched the fewest any team has shot in a playoff game since 2006. 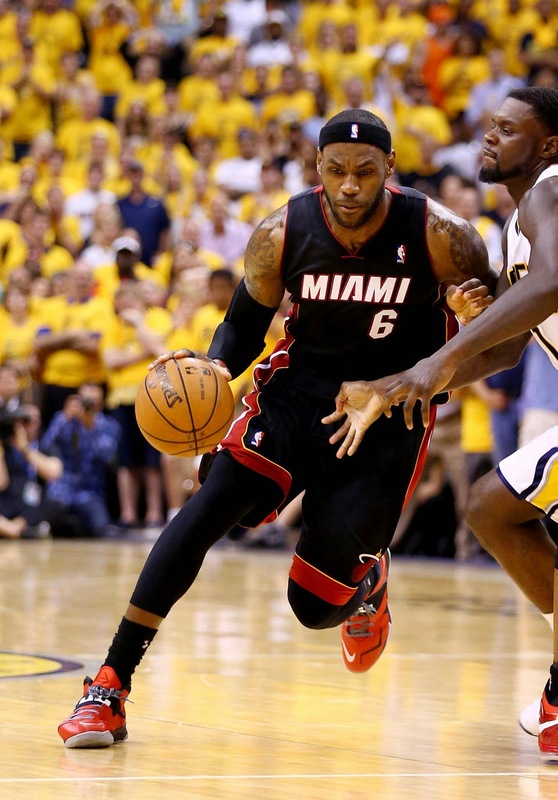 Almost everything went wrong for Miami in Game 5, and the Heat still nearly won. James shot just 2 for 10 in 24 minutes, and got his fifth foul with 8 1/2 minutes left in the third quarter, with the Heat leading by eight. Miami went scoreless on nine of its first 12 possessions after James checked out and the Pacers used that stretch to build a five-point lead, the margin eventually reaching seven when George connected on a 3-pointer at the third-quarter buzzer. Down by as many as 11 in the fourth, Miami had a chance to take the lead in the final seconds, but Chris Bosh's 3-pointer bounced away. And with that, the Heat started the process of turning the page to Friday night, when they could punch their fourth straight ticket to the NBA Finals.